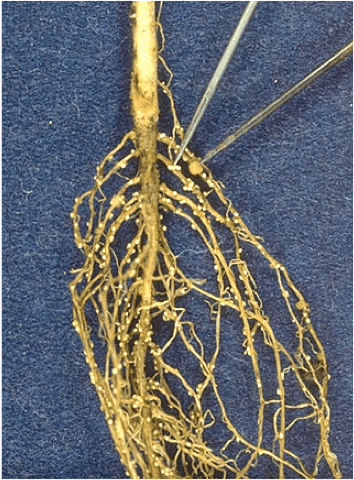 Soybean Cyst Nematode (SCN) is a microscopic worm (Heterodera glycines) that burrows into root cells of soybean plants, depriving the plant nutrients and providing wound sites for other pathogens to enter. SCN infestations can be difficult to detect because in many situations it produces no visible symptoms. 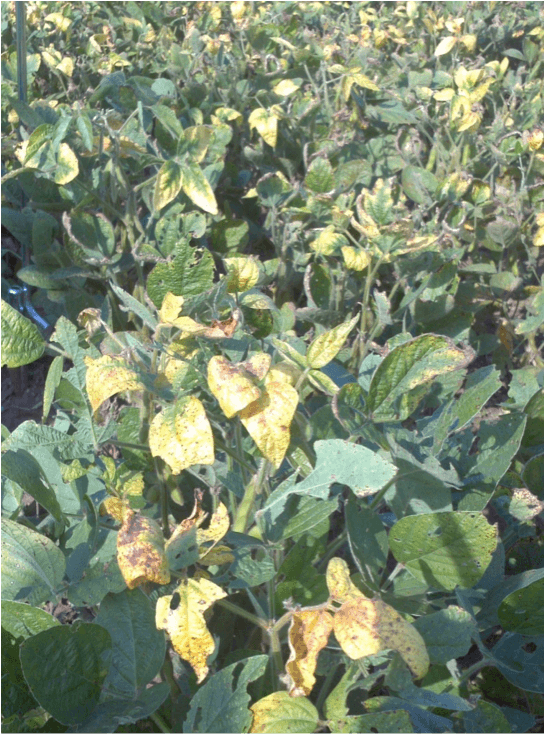 Some symptoms that can be an indication of an SCN infestation include: slow canopy closure, stunting of plants, yellowing of the edges of leaves (mimic potassium deficiency), poor stands, and decreased yields. Female SCN can be found on plant roots and in the soil around the roots, most readily in the fall. Hence, soil samples and root digs to check for SCN infestations are best done from beginning bloom to just after harvest. SCN can enhance other soil borne diseases, such as Sudden Death Syndrome, Charcoal Rot, and root rots such as Rhizoctonia and Fusarium, by producing wounds (feeding sites) that the fungal pathogens can enter the plant through. Management begins with confirming the presence of SCN by sampling plant roots and soil near root area in the fall. An integrated management approach, using a combination of the options listed below is needed to successfully management SCN. Variety selection – selecting and rotating varieties with SCN resistance will help manage SCN populations and reduce yield loss. See yearly variety disease ratings pdf publications here and searchable database (link created once ready).